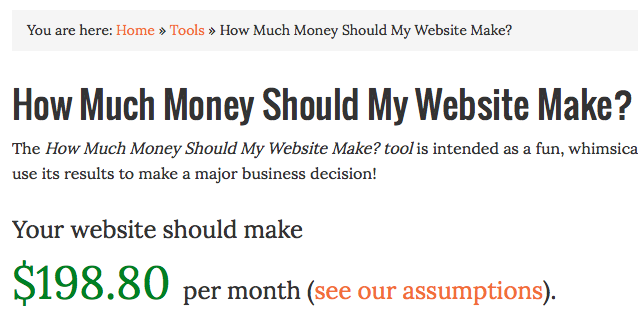 » Our Latest Tool: How Much Money Should Your Website Make? Our Latest Tool: How Much Money Should Your Website Make? It is with great fanfare and pride that I announce the latest of the MonetizePros tools, the How Much Money Should My Website Make? Tool. The tool asks you to input some basic information about your site (such as your niche, and monthly traffic). Next it uses public data, along with some (simplistic) formulas, to forecast what your site’s monthly revenue “should” be. Note, it only works for e-commerce or publisher sites that monetize with display ads. Also note, the tool is whimsical in nature, and its results range from moderately accurate to wildly inaccurate! Oh, and for the record, www.MonetizePros.com “should” be earning $198.80 per month. Who knew? Go check out the tool now.